I am going to pick this up after work today. More details to follow. The seller and I agreed to $10 so I figured I can't pass it up.... but what to do with it? I am thinking make it a lower-geared (65 gear inch???) single speed to ride in the winter and to make happy hour runs with the wife! nice!Nothing wrong with a $10 beater bike. That's what I figured! I can't pass it up because it's worth $10 even it it's a "low end" Nishiki.... I may just make it a single speed, make sure it's safe and put one of my kids on it! Still a way better bike than a dept store bike! Pics once I got it home - I will post in the mechanics forum too, but does anyone know if I can easily convert this existing crankset to 1x? Check your chain line with your single speed wheel, you might be able to just remove the big ring from your existing crank set and save even more money. Awesome! Thanks! checking out your links now! For mostly aesthetic reasons, I prefer to use the smaller, 40T ring with about a 16T/15T rear cog depending on what wheels and tires I can dig up to go on it. Ok - So lemme say awesome pics - mine is hi tensile steel yours is a nicer frame. You should see it now all taken apart and cleaned! looking forward to the updated photos! I bet it looks good cleaned up! I like to use 67-71 gear inches around town. 65 should give you good power. For conversion - is that hub a freewheel or cassette? If it is cassette, its easy enough to put your cog at the place where it gives a good chain-line. For a freewheel the positioning is generally fixed, but typically works well. The problem there is that single speeds wheels are typically 120mm wide, while modern cassettes are 135mm (maybe a 130mm on your older bike. I've used thick nylon washers to shim up the 10mm if I needed to. This is as far as I have it - looking for a new crankset and possibly thinking about converting to 26" aluminum wheels. Are your exiting brakes long enough for 26in wheels (I'm assuming old MTB wheels). The Bead Seat Diameter on a 26in MTB wheel is 559mm. If you had 1970~80s 27in wheel on this bike, then the BSD was 630mm. So your brakes have to have enough adjustment (on the radius) to reach 36mm "down" to the hub center. ANYWAY..... looking at the pics, the brakes are probably plenty long to reach 700c rims (if the old rims are 27in). And - probably - a frame like this will take a 35 or 38mm tire. And you can go fixed through corners with 170mm cranks and most pedals. my two pfennig and worth half after converting to US$. It will be a single speed freewheel. I just thought I’d use 26ers because I have some neat tires already! I do have some brakes in the parts bin which are pretty “long”. Then again maybe I willing just use the old 700c wheels off my track bike and upgrade there..... decisions, right? Starting to look like a real bike! Here's an update - I was going through this thread getting ready to delete subscription notifications. Funny that the simple SS beater bike is what it eventually became, although it went through an awkward drop bar, "trackie" phase!! 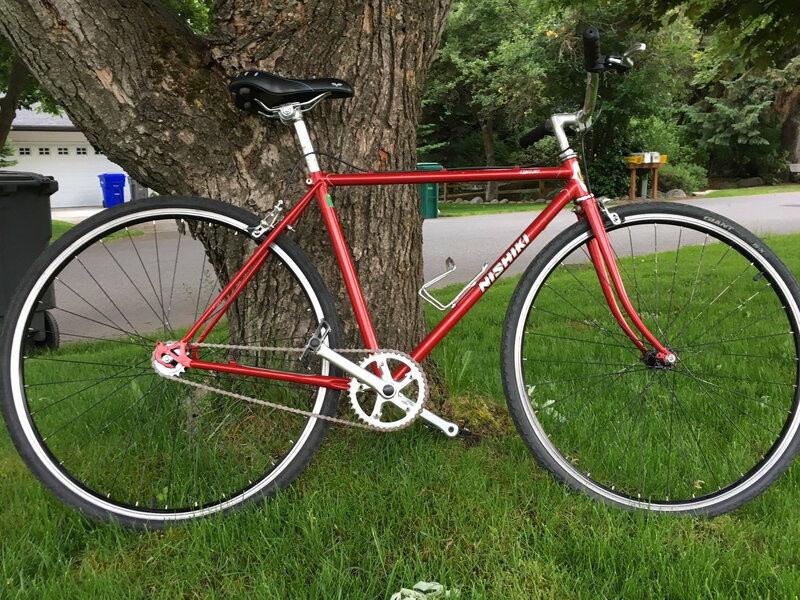 I have an affinity for old Nishikis - my first road bike was an 80s Nishiki, which eventually became a fixed gear, and it taught me most of what I know about wrenching. I have one of those old Avocet leather touring saddles, and it's comfy as all get out. Don't get rid of it. Wow, that cleaned up real nice! Good job! I really wish I know how to find these $10 deals. Very nice. I am glad you did not try to fit 26” wheels on it.